Last Wednesday, Daniel S. Eads ’08 and Sotirios D. Karanikas ’08 were elected president and vice president of the InterFraternity Council, respectively. Eads, along with the rest of the new executive board, will be faced with several key issues, including improving relations with the Boston city police and continuing to work with the Panhellenic Association on fall recruitment. The Campaign for Students, a new fundraising campaign that hopes to raise at least $500 million to benefit undergraduate and graduate students, was announced to the MIT Corporation last Friday. According to a press release supplied by Kirk D. Kolenbrander, vice president for institute affairs and secretary of the Corporation, the $500 million will be raised over the next five years and will support scholarships for undergraduate students, fellowships for graduate students, student life, and any efforts that result from the report of the Task Force on the Undergraduate Educational Commons. Theresa M. Stone SM ’76, the current chair of the MIT Investment Management Company, has been named MIT’s next executive vice president and treasurer. 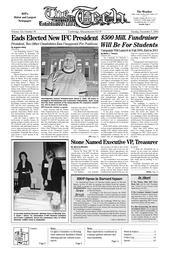 Stone will replace Sherwin Greenblatt ’62, interim executive vice president and treasurer, in February 2007. Greenblatt has been serving as executive vice president since August 2005. An International House of Pancakes finally opened in Harvard Square on Nov. 22 after its opening was delayed from the summer. The IHOP is located on 16-18 Eliot Street across from the Charles Hotel, somewhat off-the-beaten-path from the rest of Harvard Square. Governor-elect Deval L. Patrick promised college leaders, students, and others Friday that he would be a champion of public higher education, but warned that state finances were limited. For both Mark Homnick and Joseph E. Palaia IV G, the turning point came after reading “The Case for Mars,” a 1996 book by aerospace engineer Robert Zubrin. The following incidents were reported to the MIT, Cambridge, or Harvard Police between Nov. 18 and Nov. 30, 2006. This summary does not include incidents such as false alarms, general service calls, or medical shuttles.